2017 started off with a bang! A bang that I didn’t plan. Unanticipated. Quite frankly, if my life were a NASCAR race, a caution would be nice about now, with a yellow flag that means all cars hold up now and a restart follows. But a NASCAR race my life is not. The day after Christmas I was walking the dog in flip-flops, down a hill when we began to run. In a blink of an eye I rolled my foot and broke my fifth metatarsal bone! 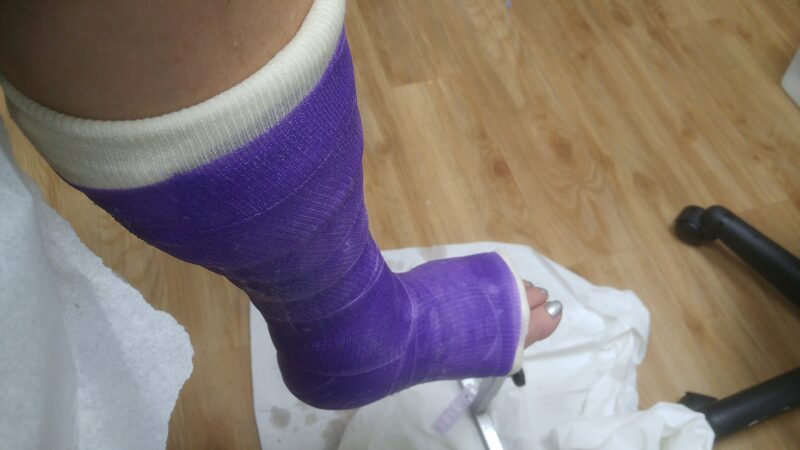 A broken foot…. a life interrupted. Just like that, I said hello to a brightly colored cast and a shiny new pair of crutches complete with an accessory pack that included pads. No more teaching fitness classes for at least the next three months. Did I mention I live for working out? Oh yeah, and I have an elven month old beagle who needs to walk, and walk a lot. Needless to say, we’ve all had to compromise in so many ways. And my nerves wear thin. Instantly it seemed like my life became a land overgrown with dense forest and tangled vegetation. Last I checked I don’t live in the tropics. Yet I find myself suffocating by these limitations, both physical and emotional. Days passed and I crutched through them, navigating the uneven trail as I journeyed through the jungle. January came and then February and x-rays revealed little to no bone bridging (the two parts coming back together). Through the dense fog my belief and faith in God’s promises seemed to wane. Some days I’m stronger than others but I continue to remind myself of what God says in Psalm 46:1, that He is my strength and my refuge. And then I talk to God. I tell him of my frustration, my disappointment, my distrust and unbelief. And as February carried on, on a given Friday I crutched my way to my boss’s office for our regularly scheduled meeting. I sat down and began our meeting as outlined on the agenda that I put in front of him. My boss looked at me and said Tracy I have bad news. His words echoed as he said we’ve eliminated your position. I remained calm and sorted out a few details and then crutched my way down the hallway to collect myself. The clacking audible noise made by my crutches resonated in my head like loud drums as the soundtrack to my jungle. God was with me during that ever-brief morning meeting. His peace completely took hold of me, my heart, my emotions, and my mouth as evidenced by Colossians 3:15. Suddenly my jungle world experienced what felt like a monsoon. It felt like I was covered by vegetation so dense I could barely move. Overtaken by the what if’s, what now’s, and the I just don’t knows, I move on through the jungle, seeking an open canopy of trees so I can get a glimpse of the sun. Listen, I have my moments of belief. It’s hard. Some days I don’t see sunshine through the trees. Some days it’s all dark and murky. But I have to cling to what I know IS true. As I weave my way through this jungle book season of my life and what feels like nature completely untamed and out of control, I give thanks to God for what was, what I experienced, and all that I learned. My time at my former job was amazing and incredible in every way. God did so much in me during the last four years and I am so grateful. He taught me lifelong lessons and put some amazing people in my path. He changed me in permanent ways, making me more like Him. On better days I am so very hopeful and excited for what God has for me next. I haven’t written in the last two months because it’s been hard. Hard for me to articulate the sweet joy in everyday. In this jungle I find myself feeling isolated from civilization, feeling powerless, disoriented, and often times immobilized. To this I say, hold up Tracy. This is not you. This is not what God has planned for you. And I hold onto Him. God hasn’t given me a spirit of fear. He’s given me a spirit of power and love. He understands my deepest longings and my heartache. He has gone before me. I’ll look up and I won’t give up. I’m so sorry to hear about your foot and your job loss. I understand what you are going through, having been through a layoff a couple of years ago that rocked my world. May you see glimmers of sunshine as you walk this journey. Praying only God’s best for you!